Just a really quick birthday card for a work colleague today. Stamps are a mix - borders are Autumn Leaves and flowers are ISC and Basic Grey. 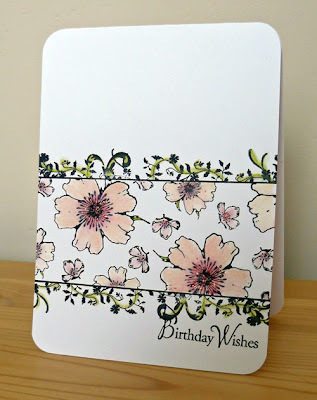 Basically I stamped the borders, masked them with Post-Its and then stamped the flowers. Added a bit of colour and glittered the flowers and that was it! I can't take any credit for this as it's a blatent rip off of a lovely card I received for my own birthday from my dear friend Gemma. Entering this for Papertake Weekly (sparkly theme, used glitter) and Stamp Something for which the theme is celebrate. Love the card Katy, stunning as ever. Agree with Kate so elegant. Lovely clean lines, a smashing card Katy.